AeroSearcher has launched a one-of-a-kind search engine that indexes and makes searchable more results in each aviation search type than any where else on the web. The service focuses on three aviation search types: aircraft for sale, aviation jobs, and aviation parts and products. AeroSearcher is the aviation search engine that lands results. 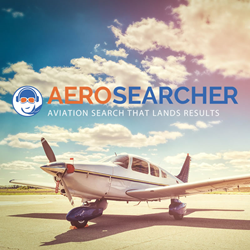 Today AeroSearcher announces the launch of its aviation search engine which enables the easy search of three primary aviation search types: aircraft for sale, aviation jobs, and aviation parts and products. The company expects the search to be a major leap forward for enthusiasts and professionals in the aviation industry. "Prior to the launch of AeroSearcher individuals looking for a plane, an aviation job, or a particular product needed to visit five, six maybe even ten different websites to view the majority of available options," says Todd Hogan, one of AeroSearcher's founders. "Today, with our launch, the aviation searcher can find what they're looking for in seconds. It's essentially the 'Uberization' or 'Airbnb-ification' of aviation search." AeroSearcher is careful to explain that they are not an aircraft classifieds service nor an aviation jobs classified site nor an aviation store. They do not store listings on their site but simply make finding any particular aviation listing far easier than ever before. With more than 20,000 aircraft listed, over 30,000 aviation jobs and more than 50,000 aviation parts and products indexed by the search engine there is no other resource available that even comes close to the depth and breadth AeroSearcher gives to someone looking for information in the aviation community. The company sees this as the beginning of a long journey to enhance and improve access to aviation information. "This is just a start," says Mr. Hogan. "Aviation, despite being so dependent on technology, has actually lagged behind most of the online community in making recent innovations included in the aviation experience. We aim to fix that." As part of their push to modernize aviation search the company has focused on making their UI simple and intuitive and their filtering of search results simple yet robust. With a host of features previously unavailable to searchers AeroSearcher sees numerous opportunities to bring increased ease and capability to aviation community. AeroSearcher is the aviation search engine that lands results. Launched in November of 2018 the search engine indexes more than 20,000 aircraft, more than 30,000 aviation jobs, and more than 50,000 aviation parts and products. It is the easiest and fastest way to find the aviation result you are looking for.